Andrew Cebulka, courtesy of Charleston Wine and Food. The Roasted Goat / The temps got chilly Thursday night but the grills were going, serving goat in all kinds of forms at this event at Highwire Distilling that featured a fife and drum band. Andrew Cebulka, courtesy of Charleston Wine and Food. Suggested Sip / What goes well with goat? (You should learn since it’s one of the new favorite proteins of many chefs.) Fresh, crisp Foggy Ridge Cider that is light years away from that stuff that hit the market in the era you were jamming to tunes at Lilith Fair. Adam Chandler, courtesy of Charleston Wine and Food. Culinary Village Crowds / Marion Square was the epicenter of the festival, and crowds packed in the space throughout the weekend. 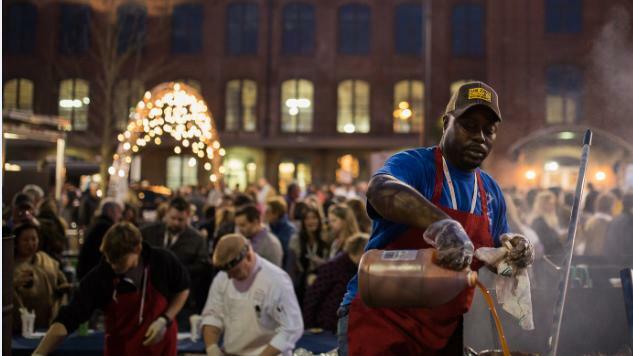 They participated in everything from baking biscuits to beer samples to chatting up chefs alongside a bevy of Cowboy Cauldrons. Andrew Cebulka, courtesy of Charleston Wine and Food. Hey, it was Friday night, so out came the mechanical bull, plenty of John Lewis Brisket, beer, and all the sides, and the crowd partook in an Austin tradition -- Chicken Sh*t Bingo. Yep, it’s what you think it is. Stephanie Burt Jim N’ Nick’s BBQ Tent Revival / Hosted by Jim N’ Nicks and the Southern Foodways Alliance, this was an epic party celebrating some of the best pitmasters and BBQ in the South, along with exquisite cocktails and a sing-along. Minette Hand, courtesy of Charleston Wine + Food. Feast and Fire / Goat Island, a private spit of land only accessed by boat, was the setting for the magical Feast and Fire Saturday evening. Chefs, including Craig Deihl (seen here), cooked over open flame. Stephanie Burt Shucked/ Oysters were the thing at Saturday’s Shucked, from the beautiful selects from purveyors such as Clammer Dave and Rappahannock Oyster Co., to the shuck-your-own roasted variety, where messy was good, especially with a little cocktail sauce and crackers. Stephanie Burt Southern Soul Barbeque’s famous Brunswick Stew warmed up a chilly night at Toasted: Up in Smoke. The two large central tents that comprised the anchor of the event in Marion Square were deconstructed and re-imagined as an experience that included a hands-on kitchen, plenty of grilling, a spirits and wine hub, and a biergarten. There was also a teepee which housed Heritage Radio (who streamed live interviews throughout the festival) and a “pop-up” wine shop where people could purchase some of the wines they enjoyed. Speaking of wines, there were plenty of wine pairings with multi-course dinners (including a standout Sparkling + Spice Dinner collaboration between Lee Lee’s Hot Kitchen and Chef Katie Button), but for the most part, the high heels and suit and tie were traded more often for boots and jeans. More casual offerings and some excursions outside the city to experience the bounty of the region peppered the programming and provided attendees with a little rowdy fun and a lot of facetime with chefs, pitmasters and more.